Figure 1. [A] Location of the right carotid artery in the head and neck. [B] Cross-section of a normal carotid artery that has normal blood flow. [C] A carotid artery that has plaque buildup and reduced blood flow. Figure 3. Carotid artery stenting. Carotid artery disease is a condition in which a fatty material called plaque builds up inside the carotid arteries. There are two common carotid arteries – one on each side of the neck – that divide into internal and external carotid arteries. 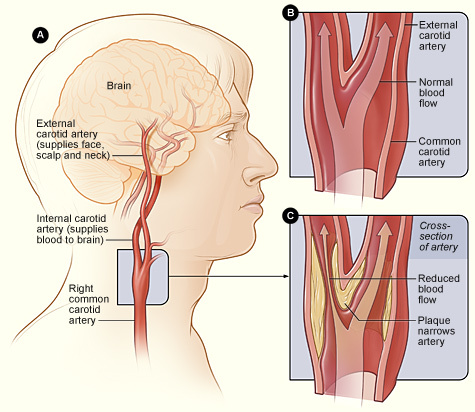 The internal carotid arteries supply oxygen-rich blood to the brain. The external carotid arteries supply oxygen-rich blood to the face, scalp, and neck. Carotid artery disease can be very serious because it can cause a stroke, or "brain attack." A stroke occurs when blood flow to the brain is cut off. If blood flow is cut off for more than a few minutes, the cells in the brain start to die. This impairs the parts of the body that the brain cells control. A stroke can cause lasting brain damage, long-term disability, paralysis (an inability to move), or death. When plaque builds up in arteries, the condition is called atherosclerosis. Over time, plaque hardens and narrows the arteries. This limits the flow of oxygen-rich blood to your organs and other parts of your body. Atherosclerosis can affect any artery in the body. For example, when plaque builds up in the coronary arteries, a heart attack can occur. 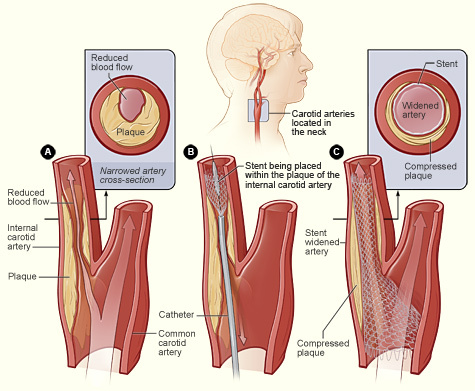 When plaque builds up in the carotid arteries, a stroke can occur. A stroke also can occur if blood clots form in the carotid arteries. This can happen if, over time, the plaque in an artery cracks or ruptures. Blood cells called platelets stick to the site of the injury and may clump together to form blood clots. Blood clots can partly or fully block a carotid artery. Also, a piece of plaque or a blood clot can break away from the wall of the carotid artery. It can travel through the bloodstream and get stuck in one of the brain's smaller arteries. This can block blood flow in the artery and cause a stroke. Carotid artery disease causes more than half of the strokes that occur in the United States. Other conditions, such as certain heart problems and bleeding in brain, also can cause strokes. Lifestyle changes, medicines, and/or medical procedures can help prevent or treat carotid artery disease and may reduce the risk for stroke. If you think you're having a stroke, you need urgent treatment. Call emergency services right away if you have symptoms of a stroke (don't drive yourself to the hospital). Getting care within 1 hour of having symptoms is important. You have the best chance for full recovery if treatment to open a blocked artery is given within 6 hours of symptom onset. Ideally, treatment should be given within 3 hours of symptom onset. When damage occurs, your body starts a healing process. The healing may cause plaque to build up where the arteries are damaged. Over time, the plaque may crack. Blood cells called platelets stick to the injured lining of the artery and may clump together to form blood clots. The buildup of plaque or blood clots can severely narrow or block the carotid arteries. This limits the flow of oxygen-rich blood to your brain and can cause a stroke. Certain traits, conditions, or habits may raise the risk for carotid artery disease. These conditions are known as risk factors. The more risk factors you have, the more likely you are to get the disease. You can control some, but not all, risk factors. Diabetes. With this disease, the body's blood sugar level is high because the body doesn't make enough insulin or doesn't use its insulin properly. People who have diabetes are four times more likely to have carotid artery disease than people who don't have diabetes. Overweight or obesity. The most useful measure of overweight and obesity is the body mass index (BMI). BMI measures your weight in relation to your height and gives an estimate of your total body fat. A BMI between 25 and 29 is considered overweight. A BMI of 30 or more is considered obese. Carotid artery disease may not cause signs or symptoms until it severely narrows or blocks the carotid arteries. Signs and symptoms may include a bruit, a transient ischemic attack (TIA), or a stroke. During a physical exam, your doctor may listen to your carotid arteries with a stethoscope. He or she may hear a whooshing sound called a bruit. This sound may suggest changed or reduced blood flow due to plaque. To find out more, your doctor may order tests. For some people, having a TIA, or "mini-stroke," is the first sign of carotid artery disease. During a mini-stroke, you may have some or all of the symptoms of a stroke. However, the symptoms usually go away on their own within 24 hours. Even if the symptoms stop quickly, you should see a doctor right away. Call emergency services. It's important to get checked and to get treatment started within 1 hour of having symptoms. A mini-stroke is a warning sign that you're at high risk of having a stroke. You shouldn't ignore these symptoms. About one-third of people who have mini-strokes will have strokes if they don't get treatment. Although a mini-stroke may warn of a stroke, it doesn't predict when a stroke will happen. A stroke may occur days, weeks, or even months after a mini-stroke. In about half of the cases of strokes that follow a TIA, the stroke occurs within 1 year. Most people who have carotid artery disease don't have mini-strokes before they have strokes. The symptoms of stroke are the same as those of mini-stroke, but the results are not. A stroke can cause lasting brain damage, long-term disability, paralysis (an inability to move), or even death. Getting treatment for a stroke right away is very important. You have the best chance for full recovery if treatment to open a blocked artery is given within 6 hours of symptom onset. Ideally, treatment should be given within 3 hours of symptom onset. Make those close to you aware of stroke symptoms and the need for urgent action. Learning the signs and symptoms of a stroke will allow you to help yourself or someone close to you lower the risk for damage or death from a stroke. Your doctor will diagnose carotid artery disease based on your medical history and the results from a physical exam and tests. To check your carotid arteries, your doctor will listen to them with a stethoscope. He or she will listen for a whooshing sound called a bruit. This sound may indicate changed or reduced blood flow due to plaque. To find out more, your doctor may order tests. A standard carotid ultrasound shows the structure of your carotid arteries. A Doppler carotid ultrasound shows how blood moves through your blood vessels. For this test, your doctor will inject a special substance (called contrast dye) into a vein, most often in your leg. The dye travels to your carotid arteries and highlights them on X-ray pictures. Computed tomography, or CT, angiography takes X-ray pictures of the body from many angles. A computer combines the pictures into two- and three-dimensional images. Treatments for carotid artery disease may include lifestyle changes, medicines, and medical procedures. The goals of treatment are to stop the disease from getting worse and to prevent a stroke. Your treatment will depend on your symptoms, how severe the disease is, and your age and overall health. Making lifestyle changes often can help prevent carotid artery disease or keep it from getting worse. For some people, these changes may be the only treatment needed: Follow a healthy eating plan to prevent or lower high blood pressure and high blood cholesterol and to maintain a healthy weight. Increase your physical activity. Check with your doctor first to find out how much and what kinds of activity are safe for you. If you're overweight or obese, lose weight. If you smoke, quit. Avoid exposure to secondhand smoke. To help keep carotid artery disease from getting worse, follow an eating plan that's low in saturated and trans fats, sodium (salt), and cholesterol. Therapeutic Lifestyle Changes (TLC) and Dietary Approaches to Stop Hypertension (DASH) are two examples of healthy eating plans. TLC. Your doctor may recommend TLC if you have high cholesterol. TLC is a three-part program that includes a healthy diet, physical activity, and weight management. With the TLC diet, less than 7 percent of your daily calories should come from saturated fat. This kind of fat is mainly found in meat and poultry, including dairy products. No more than 25 to 35 percent of your daily calories should come from all fats, including saturated, trans, monounsaturated, and polyunsaturated fats. You also should have less than 200 mg a day of cholesterol. The amounts of cholesterol and the different kinds of fat in prepared foods can be found on the Nutrition Facts label. Foods high in soluble fiber also are part of a healthy eating plan. They help block the digestive tract from absorbing cholesterol. These foods include: Whole grain cereals such as oatmeal and oat bran Fruits such as apples, bananas, oranges, pears, and prunes. Legumes such as kidney beans, lentils, chick peas, black-eyed peas, and lima beans A diet high in fruits and vegetables can increase important cholesterol-lowering compounds in your diet. These compounds, called plant stanols or sterols, work like soluble fiber. Fish are an important part of a healthy diet. They're a good source of omega-3 fatty acids, which help lower blood cholesterol levels. Try to have about two fish meals every week. Fish high in omega-3 fats are salmon, tuna (canned or fresh), and mackerel. You also should try to limit the amount of sodium that you eat. This means choosing low-sodium and "no added salt" foods and seasonings at the table or when cooking. The Nutrition Facts label on food packaging shows the amount of sodium in the item. Try to limit drinks with alcohol. Too much alcohol will raise your blood pressure and triglyceride level. (Triglycerides are a type of fat found in the blood.) Alcohol also adds extra calories, which will cause weight gain. Men should have no more than two drinks containing alcohol a day. Women should have no more than one drink containing alcohol a day. DASH. Your doctor may recommend the DASH eating plan if you have high blood pressure. The DASH eating plan focuses on fruits, vegetables, whole grains, and other foods that are healthy and lower in salt/sodium. This eating plan is low in fat and cholesterol. It also focuses on fat-free or low-fat milk and dairy products, fish, poultry, and nuts. The DASH eating plan is reduced in red meats (including lean red meat), sweets, added sugars, and sugar-containing beverages. It's rich in nutrients, protein, and fiber. The DASH eating plan is a good healthy eating plan, even for those who don't have high blood pressure. Regular physical activity can lower many carotid artery disease risk factors, including LDL ("bad") cholesterol, high blood pressure, and excess weight. Physical activity also can lower your risk for diabetes and raise your levels of HDL cholesterol (the "good" cholesterol that helps prevent plaque buildup). Check with your doctor about how much and what kinds of physical activity are safe for you. Unless your doctor tells you otherwise, try to get at least 30 minutes of moderate-intensity activity on most or all days of the week. You can do the activity all at once or break it up into shorter periods of at least 10 minutes each. Moderate-intensity activities include brisk walking, dancing, bowling, bicycling, gardening, and housecleaning. More intense activities, such as jogging, swimming, and various sports, also may be appropriate for shorter periods. Maintaining a healthy weight can decrease risk factors for carotid artery disease and stroke. Even a modest weight gain of a few pounds a year can almost double your chances of having a stroke. If you're overweight, aim to reduce your weight by 7 to 10 percent during your first year of treatment. This amount of weight loss can lower your risk for carotid artery disease and other health problems. After the first year, you may have to continue to lose weight so you can lower your body mass index (BMI) to less than 25. BMI measures your weight in relation to your height. A BMI between 25 and 29 is considered overweight for adults. A BMI of 30 or more is considered obese for adults. A BMI of less than 25 is the goal for preventing and treating carotid artery disease. If you smoke or use tobacco, quit. Smoking can damage your arteries and raise your risk for stroke and other health problems. Talk to your doctor about programs and products that can help you quit. You may need medicines to treat diseases and conditions that damage the carotid arteries. High blood pressure, high blood cholesterol, and diabetes can worsen carotid artery disease. Some people can control these problems with lifestyle changes. Others also need medicines to achieve and maintain control. You may need antiplatelet medicines to prevent blood clots from forming in your carotid arteries and causing a stroke. Damage and plaque buildup make blood clots more likely. Aspirin and clopidogrel are two common antiplatelet medicines. They stop platelets from clumping together to form clots. These medicines are a mainstay of treatment for people who have known carotid artery disease. Your health care team will help find a treatment plan that's right for you. Sticking to this plan will help avoid further harm to your carotid arteries. 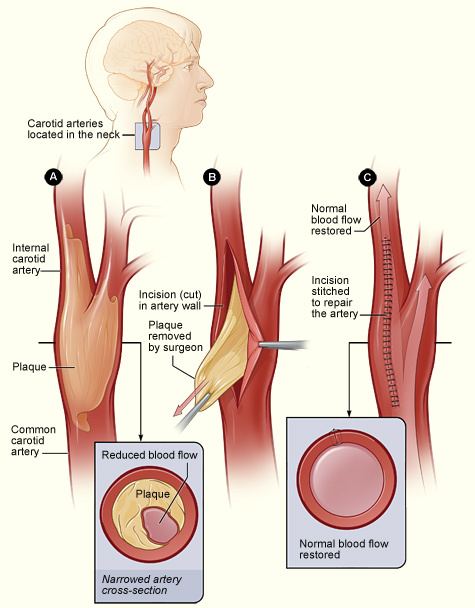 You may need a medical procedure to treat carotid artery disease. Doctors use one of two methods to open narrowed or blocked carotid arteries. This treatment is mainly for people whose carotid arteries are blocked 50 percent or more. See Figure 2. For the procedure, a surgeon will make a cut in your neck to reach the narrowed or blocked carotid artery. He or she will make a cut in the artery and remove the plaque inside. The artery and your neck will then be stitched up. Doctors use a procedure called angioplasty to widen the carotid arteries and restore blood flow to the brain. See Figure 3. A thin tube with a balloon on the end is threaded through a blood vessel in your neck to the narrowed or blocked carotid artery. Once in place, the balloon is inflated to push the plaque outward against the wall of the artery. A stent (a small mesh tube) is then put in the artery to hold the plaque back and keep the artery open. Making lifestyle changes and taking prescribed medicines are important steps. For information on healthy eating plans, physical activity, maintaining a healthy weight, and medicines, see "How is carotid artery disease treated?" If you have carotid artery disease, you can take steps to stop it from getting worse. Make lifestyle changes, follow your treatment plan, and know the warning signs of stroke. Follow a healthy eating plan that's low in fats, sodium (salt), and cholesterol. Increase your physical activity. Check with your doctor first to find out how much and what kinds of activity are safe for you. If you smoke, quit. Avoid exposure to secondhand smoke. For more information, see "How is carotid artery disease treated?" Following your treatment plan is important. It may help prevent your carotid artery disease from getting worse. It also can lower your risk for stroke and other health problems. You may need to take medicines to control certain risk factors and to prevent blood clots that could cause a stroke. Taking prescribed medicines and following a healthy lifestyle can help control carotid artery disease. However, they can't cure the disease. You will likely have to stick with your treatment plan for life. Most people who have the disease will need to have their blood pressures and blood cholesterol levels tested one or more times a year. If you have diabetes, you'll also need routine blood sugar tests and other tests. If you've had a stroke or procedures to restore blood flow in your carotid arteries, you will likely need a yearly carotid Doppler ultrasound test. This test shows how well blood flows through your carotid arteries. Repeating this test over time will show whether the narrowing or blockage in your carotid arteries is getting worse. Results also can show how well procedures to treat your arteries have worked.